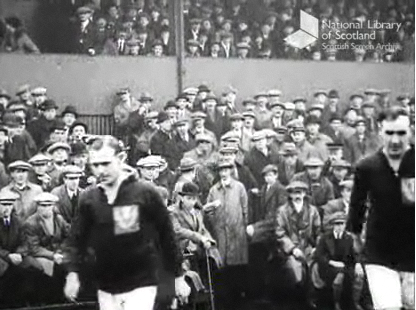 The film features many of the players who won the Scottish Cup later in the year – the team was Kenny Campbell, Tom Crichton, Willie Bulloch, Joe Harris, Willie Hamilton, Jimmy McMullan, John Blair, Jimmy Kinloch, Robert McFarlane, Jimmy McMenemy and Walter Salisbury, and the film shows all the players run out onto the pitch. Unfortunately the footage is taken from behind Kenny Campbell’s goal and shows only the two goals scored by Motherwell and not the goals scored by Robert McFarlane and Walter Salisbury. 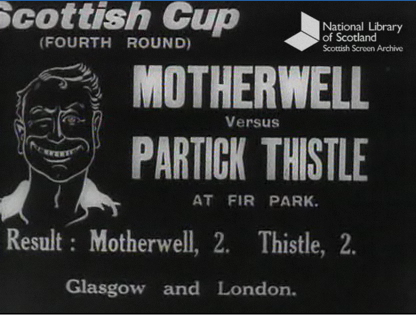 Was unable to see the film of Partick Thistle vs Motherwell 1921. My husbands father played for Partick Thistle. If you click the link at the bottom of the article you’ll be taken to the film. Or go to http://movingimage.nls.uk/film/3357. Does your family have any of Willie’s memorabilia that I might share on the site?